Casa de Victor is a gorgeous single-family home right by Sandy Beach. 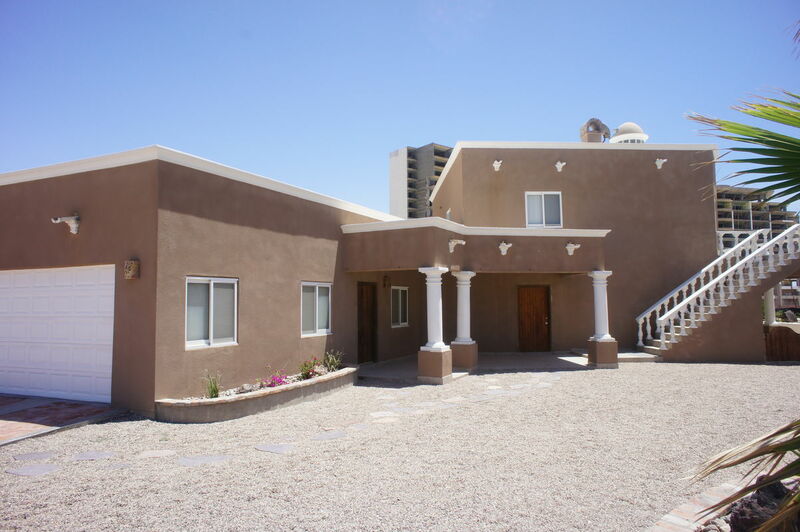 The home has 3 bedrooms and two bathrooms with accommodations for up to 8 guests. This is a newer home with a very modern and elegant curbside appeal. The home is dark tan with bright white trim. The home is two stories, which allow you to have a view from just about anywhere in the home. The 2nd floor also features a sundeck where you bask in the sun or take in the awesome ocean views. The home also comes with a garage where you can safely store your vehicle while you are staying here. The living room has raised brick finished ceilings with built in ceiling fans, and a mustard yellow micro fiber sofa that converts into a bed for two of your guests. The room includes a maple wood coffee table chest; a complimenting patterned armchair and a media unit with a flat screen TV and VCR. The wall opposite the TV also has an orange tiled fireplace for those chillier Rocky Point evenings. The room has many windows, which give it a very bright and open feel. The dining area has a dark wood rectangular shaped table with a bright blue tablecloth and seating for 6 guests. The kitchen has dark raised wood panel cabinets with cobalt blue ceramic tiled counter tops and all white appliances. The appliances include a microwave, refrigerator, flat ceramic cook top, oven and a dishwasher. The kitchen includes a coffee maker, blender, serving ware as well as cookware. There is also a pantry where you can store food and beverages. When you walk up stairs you will notice the stairs have been finished with an orange tiled trim and a large wood framed mirror adorns the walls. The upstairs bedrooms all have raised panel wood doors that really give the home a custom design feel. The master bedroom has a large king size wood framed bed with an earth tone patterned bedding set. 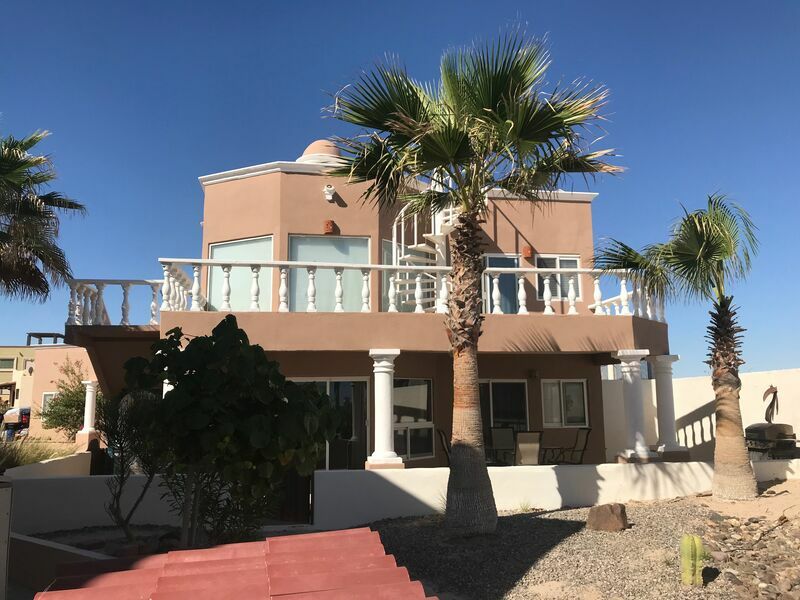 The room has lots of windows and two sliding glass doors that open to the second story sundeck where you have a gorgeous view of Sandy Beach. The wall opposite the bed has a hand carved wood dresser with three drawers and a large dark wood double door closet with more storage above. The master bathroom has a walk in shower made of glass block, a double ceramic tiled vanity sink and a commode. The 2nd guest bedroom has a queen size beech wood framed bed with a beautiful two tone wood dresser and a two lighted bed side tables. The room has windows on each side, which allow the room to be illuminated with natural light. The room also comes with a large double door closet where you can hang clothing. The 3rd bedroom also has large queen size bed with sandy colored patterned bedding set and a lighted bedside table. This room also has two sliding glass doors that open to the terrace. Across from the bed there is a 6 drawers dresser with a matching wood framed mirror mounted on the wall above. Downstairs there is a half bath with a commode and single sink mirrored vanity. The home also has an enormous laundry room off the garage where you have a full size washer, dryer and shelving throughout. The back yard is very large and even has its own paved pathway that leads right to the beach. In the rear of the home you will find a white spiral staircase that also provides access to more views and an additional sundeck. This home is beautiful and would provide a wonderful spot for that perfect family vacation. The pool is now open but is not heated. 06/16/14 08:05pm Shane I had a great stay. The pull-out couch and dishwasher need replaced.